Surprise? Not really. 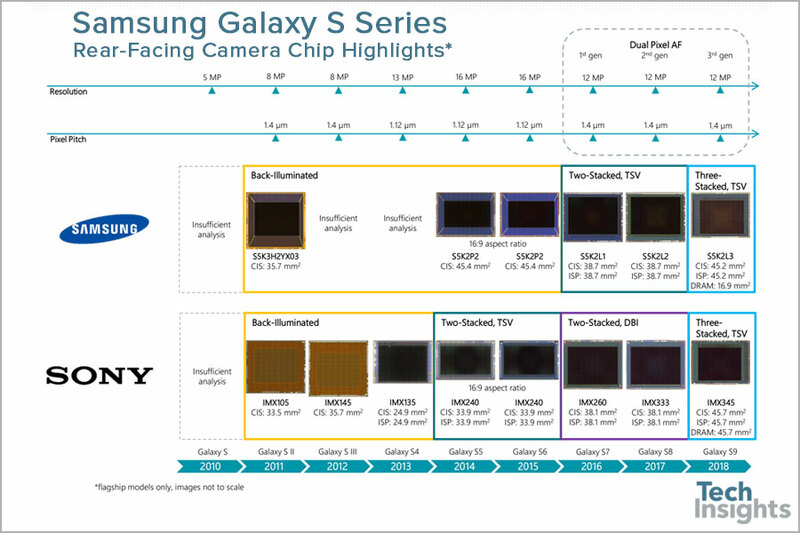 As expected, Samsung’s latest flagships come with a Sony IMX sensor in some markets, as revealed by the folks over at TechInsights in their Galaxy S9 camera teardown. Samsung has sourced the IMX345 sensor from Sony and the S5K2L3 from its own semiconductor division for its latest flagship, and both sensors come with the same specs to make possible camera features such as the adjustable aperture and Super Slow-mo (960 fps) videos. The Sony IMX345 is similar to the IMX400 used in the Xperia XZs, which was the world’s first smartphone to feature slow-motion video recording at 960 frames per second. The S5K2L3, meanwhile, is an upgrade to the S5K2L2 found on the Galaxy S8 and Galaxy Note 8. As Samsung has been pointing out time and time again, the newer chip comes with dedicated memory to make possible the faster processing needed for 960 fps videos and for combining data from multiple images to create a noise-free final picture in low-light conditions. The IMX345 has a similar setup, and as has been the case in years past, there shouldn’t be a noticeable difference between camera quality no matter which of the two sensors is inside your Galaxy S9. It’s unclear if Samsung is employing different sensors for the 8-megapixel front camera on the Galaxy S9 and S9+, but going by what the company did for the Galaxy S8 and S8+, that may well be the case. Again, it doesn’t really matter if the sensors are not the same in every market, although it’s a good indication of how Samsung continues to need Sony’s camera chips to be able to produce enough sensors to go around for the millions of Galaxy S flagships that it sells each year. Interested in checking out what camera sensor your Galaxy S9 has? Download the AIDA64 app from the Play Store and look at the details inside the app’s Devices section. Hum, is it normal that my S7 reports the main camera (from Samsung, not Sony) supports Video Snapshot and Video Stabilisation, while the S9 (in your picture) does not? The selife cam of the S7 supports Video Snapshot too. Ah, possibly an issue of the app rather than the hardware, these specs can vary often, especially since AIDA64 doesn’t count the second rear camera, either. what about the telephoto lens?